THEIR WORDS HIT SO HARD BECAUSE THEIR DESCRIPTIONS WERE SO CLEAR. If you didn’t see the BBC’s Panorama programme on Monday, you can still see it here. If you’re outside the UK, there’s also a news story here. The subject was PTSD – ‘post traumatic stress disorder’ – and the alarmingly high rates of it among British troops who had served in Afghanistan and Iraq. The ex-soldiers who gave interviews were thoughtful and frank. Men trained to think fast in life or death situations showed their reflective side. They explained their situation with disarming clarity, as did the parents, partners, and siblings of those no longer alive to tell their own stories. It was distressing. It was also shameful. Some of those interviewed had fallen on hard times, with little or no prospect of employment and, in some cases, no pensions. You imagine maimed soldiers begging on the streets during the Napoleonic Wars, and hope it could not happen today. Yet service personnel seem to be over represented among the ranks of the homeless. A quick internet search reveals that the housing charity Shelter even has a page to advise people preparing to leave the armed forces. Those in the programme that did have somewhere to live were often short of money. Journalists covering conflict can usually leave the warzone if they want to, an option not available to a soldier. Yet professional pride, in oneself, or pressure, from colleagues, can sometimes lead people to stay when they should not. Working for the BBC in Gaza, I remember being told sometimes to take a break. It is not always long term exposure which can cause PTSD. A single terrifying incident can also cause great distress. One of the soldiers featured in the programme had seen a little girl in Iraq get her legs blown off by explosives hidden in the road. 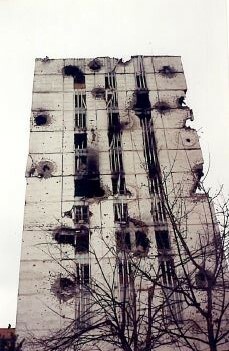 In Chechnya in 1995, a team of BBC colleagues and I were lucky to survive a Russian air force strike on a square in Grozny. The attack killed two of the fighters we had been talking to as the planes came in. We emerged from our hastily-taken shelter, still half-deafened by the explosion, to see their bodies lying on the street. I was very shaken, but relieved. Six months later, on holiday with my then girlfriend, I had terrible nightmares three nights in a row as I relived what had happened. The incident has never troubled again me in the 18 years since. I see it now as the negative experience leaving my system, but only once I felt relaxed and safe. Patrick Howse, a friend and former BBC colleague, was diagnosed with PTSD after working in Iraq. He has chosen to make public his experience. One way he has addressed it is by writing poetry. You can find some of his work on his website or on Poetry Zoo. Soldiers have long recounted their war experience in poetry, most famously in the First World War, where generally they did a better job of telling the story than the journalists who were their contemporaries. It was the First World War that brought ‘shell shock’ into common speech. It was not until much later that studies on the effects on journalists of covering combat started to be analysed. Dr Anthony Feinstein’s study (in which I took part) in the early years of this century led the way. More work has been done since, including by the Dart Center, offering practical help and advice. During that sometimes terrifying trip to the Caucasus in 1995, a more experienced colleague offered the view that, if you wanted to be totally safe, you had to stay at home. It was a reminder then, in a time when safety training for reporters covering conflict was first coming in, that there were limits to the protection it could offer. The risks are to mind as well as body.